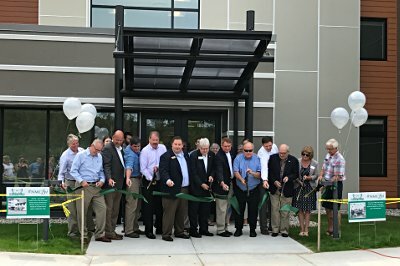 North Hall ribbon cutting ceremonyNMC’s fall semester will be bookended by celebrations of new campus facilities, with last week’s opening of the North Hall residence hall and a grand re-opening of an expanded Dennos Museum Center targeted for November. The $8.8-million, 135-bed North Hall is the first new student housing on campus in more than 40 years and was built in response to demand, since on-campus housing has been at capacity for four years. Units are designed in quad suites with shared kitchen and living space. (See a 360-degree view of the shared space.) Laundry facilities and study or meeting space is available on each floor, with a fitness center on the ground floor. Located on the eastern end of main campus, North Hall has also been designed with a flexible format where sections could be used for workforce development housing in off-peak times. In July, the Dennos Museum Center re-opened on a limited basis, with exhibitions in the Sculpture Court and Inuit gallery. Admission is reduced while the rest of the 15,000-square-foot expansion is completed. 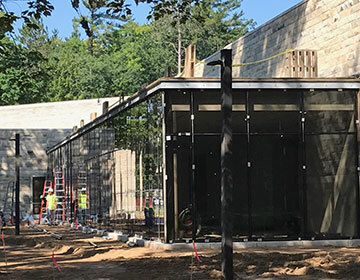 Construction of two new galleries and other renovations are scheduled to be finished this fall, with a grand re-opening of the entire museum planned for November. The expanded galleries were funded by generous donations from Richard and Diana Milock and Barb and Dudley Smith. Meanwhile, construction of the West Hall Innovation Center is set to begin in May 2018 after funds were committed in the state of Michigan fiscal 2018 budget. Once complete, the center will combine state and NMC investments of more than $7 million each for renovations and modernizations of the 50-year-old West Hall into a new multi-story library and flexible learning space. “Combined, these projects show the dedication of our NMC employees, donors, community, business and governmental partners all working together to help ensure our learners are successful,” Nelson said.